Love your dog but hate their smell? That can all change by using dogilicious - a specially formulated range just for dogs. No more putting up with that 'dog smell' anymore - simply spray with dogilicious for an amazing fragrance which lasts a long time. Order Singles or Packs -- Ordering a pack? 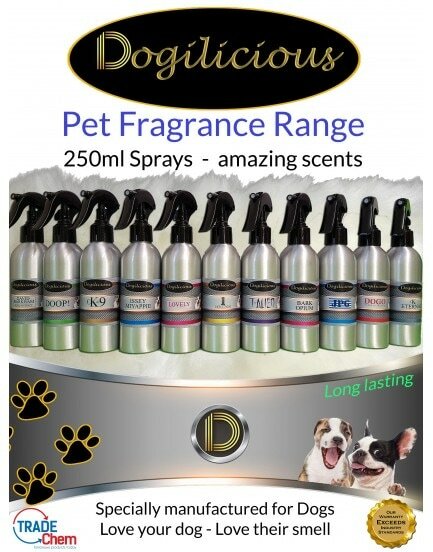 Then you can mix fragrances if you want to - just let us know which you would like..
Dogilicious is not only the closest match to 'human' fragrances, but offers the largest spray bottle available at 250ml. Aluminium bottle - keeping the fragrances very fresh. · Soothes and refreshes the skin. · All over body fragrance for your dog. · Contains extracts to soothe and refresh the skin following grooming. · Spray on coat for amazing long lasting fragrances.